“In Malta there’s no poverty.” We love to repeat this statement over and over, maybe because it assuages our conscience or maybe because it makes us feel like we’re living in a bed of roses. We replay this statement so much that now we believe it to be true. So much so, that when activists and NGOs try to raise awareness about poverty in Malta, we push them to the side lest they mar the bright lights of the shining sky scrapers and the glittery shopping malls. Children’s literature can help throw the spotlight on the realities of poverty, without any homilies or lengthy sermons. A magical story can just as easily leave an impact on a child’s imagination and spur the new generation to empathise and be more aware than ours. 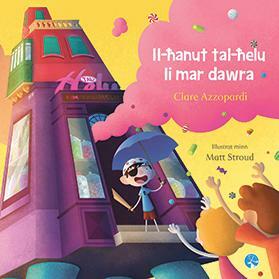 Clare Azzopardi’s new picture book, Il-Ħanut tal-Ħelu li Mar Dawra, illustrated by Matt Stroud and published by Merlin Publishers, is about a boy called Max. Every Saturday, Max stops by at this old sweet shop. In a country full of modern shops, one as soulless and as similar to the next, this little sweet shop sticks out, because it’s very old fashioned. The wooden shop windows, the old benches and the timeworn cash register gives it a charm like no other. Inside, all the sweets are displayed with dedication and love. One day something extraordinary happens: the shop starts chatting to Max, sprouts a pair of legs, and together they set off on an adventure around Malta to give away sweets. However, in some towns and villages parents are overprotective and prompt­ly scowled at the sight of sweets. “We don’t want sweets here. Please go away!” the parents tell Max and the shop. Finally, they find people who appreciate their gifts: lonely elderly people, people who live in houses with rugged walls and ajar doors, where even light fails to filter in, so that society does not have to face the stark poverty behind these doors. Here, parents rejoice as much as the children when they’re showered with sweets by Max and the shop. And from that day on, Max makes it his mission to distribute sweets toys, books, clothes and food to all those who are in need. Azzopardi is a contemporary Maltese author who specialises in children’s picture books. She has won the National Book Prize with Mingu and Il-Qtates ta’ max-Xatt. This is her first collaboration with Stroud, winner of last year’s Best Illustration with his book Fil-Kamra ta’ Jonas, penned by Noel Tanti.